What? You’re tired of Oreos after yesterday? Too bad. I happen to think the Oreo is one of the world’s most perfect cookies. It’s chocolaty, creamy, and crunchy all at the same time. Delicious. Like yesterday’s truffles, and last week’s Christmas tree brownies, this isn’t a recipe so much as a method. As in melt chocolate, dip cookie, sprinkle, eat. Easy peasy. Hey, I’m sick, you can’t expect too much from me right now. If you want something more complicated and less processed, I suggest you make rugelach or cocoons. Melt the white chocolate in shallow bowl, either in the microwave* or in a double boiler. Dip the cookies, one at time, into the white chocolate, making sure to coat all the sides evenly. 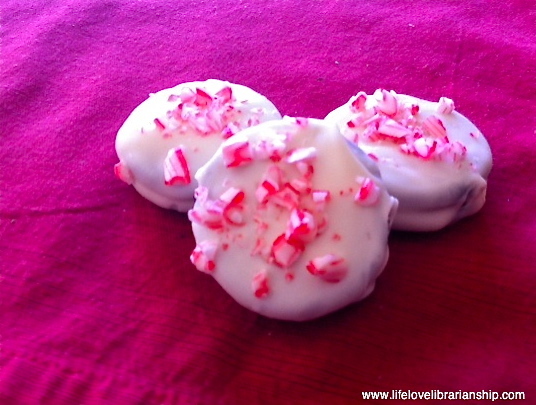 Before the chocolate hardens, sprinkle or roll in crushed peppermints. *How I melt chocolate in the microwave: Unwrap all the squares, and microwave on HIGH for 30 seconds. Stir, then continue microwaving in 30 second intervals on medium power (50%) until chocolate looks mostly melted. Stir until smooth.